WILLIAM S. GRISELL, M. D. The first physician to establish his home in Ransom was Dr. William S. Grisell, who has practiced there continuously for the past nineteen years. His importance to the community does not rest entirely upon his services as a physician, since he has actively identified himself with the forward progress of the town, has been a worker for schools, has helped to build up the village, and is not only capable in his profession but eminently public spirited. He has an interesting ancestry. His great-grandfather was a British soldier during the Revolutionary war. At one time he served under the noted Colonel Tarleton. After the war he chose to remain in America, and some years later he became one of the pioneer settlers in Ohio. He had two sons, Thomas and Nathan, but Nathan left no descendants. Thomas Grisell, grandfather of Doctor Grisell, was a blacksmith by trade. His children were: Edward, who was a farmer near Superior, Nebraska, where he died; Reverend Simeon, father of Doctor Grisell; Sherman, who was a Union soldier and was killed during one of the Virginia campaigns; Mrs. Elizabeth Starr, who died in Belmont County, Ohio; Mrs. Mary Shutts, who died near Beloit, Kansas; Mrs. Elmyra Hughes, of Eastern Ohio; and Mrs. Sarah Lawrence, who recently died in California. Rev. Simeon Grisell was born in Monroe County, Ohio, became a carpenter, and for a number of years worked at that trade. Coming west in 1888, he settled at Bartley, Nebraska, and for a few years sold furniture. He then removed to his homestead in Frontier County, Nebraska, and was both a farmer and preacher. His death occurred at Bartley, Nebraska, March 9, 1902, at the age of seventy-six. He was always a hard worker, did all he could for his family and his community, but never attained a financial competence. He was a plain and unassuming good citizen, was a member of the Masonic Lodge, and was a republican until he devoted all his energies to the prohibition cause. Rev. Mr. Grisell first married Miss Wilson, and by that marriage had the following children: Alonzo W., who was an educator and died at Sioux City, Iowa; Edward C., an undertaker at Moundsville, West Virginia; Alma, widow of Joseph N. Carle, of Lyon County, Kansas; John G. and George H., both farmers living near Mendota, Illinois. Rev. Mr. Grisell was married in 1866 to Phoebe L. Tipton, daughter of Samuel and Mrs. (Chambers) Tipton. The Tipton ancestors came out of England and settled in Maryland during Lord Baltimore's time. A branch of the family subsequently moved to Eastern Ohio, and settled on a farm. Phoebe Grisell died at Hebron, Nebraska, September 23, 1903, as the result of an injury. Her children were: Sarah E., who died in West Virginia November 22, 1886, the wife of A. L. Knapp, leaving one son; Simeon R., who is a contractor at Bartley, Nebraska; Linley S. and William S., who are twins, the former being in the drug business at Friend, Nebraska. William S. Grisell was born at Jerusalem, Monroe County, Ohio, January 31, 1873. From early boyhood he was on intimate terms of fellowship with toil, and he had to serve a varied apprenticeship as a farm hand, teacher and in other occupations before he was able to realize his ambition to become a doctor. He lived a part of his childhood in Jerusalem in that state (Ohio) until the fall of 1878, when his parents moved to Wetzel County, West Virginia. That was the family home until March, 1888, when they went to Bartley, Nebraska. Doctor Grisell attended school in Nebraska for two years, and then qualified as a teacher and taught one term in Frontier County. The following year was spent as a teacher in Red Willow County. He gained his higher education largely in the intervals of his work as a teacher. For a time he was engaged in cutting and hauling timber for a saw mill in Boulder County, Colorado. After that summer he returned to Nebraska and spent three years in the schoolrooms of Red Willow County. At the age of nineteen he had begun reading medicine with Dr. J. E. Hathorn of Bartley, Nebraska. In the fall of 1894, after completing a term of school as teacher, he entered the College of Physicians and Surgeons at Keokuk, Iowa. His means did not permit him a continuous course and he subsequently returned home and taught two more terms of school and also worked during the summer months in Frontier County. In 1897 he entered the Kansas City Medical College, now the medical department of the State University of Kansas, and finished his course there March 29, 1899, being granted his degree of Doctor of Medicine. Since his graduation Doctor Grisell has taken post-graduate short courses in the University of Kansas School of Medicine. March 30, 1899, the day following his graduation Doctor Grisell arrived at Ransom, Kansas. The town had no physician then, and the sick usually called in an old time doctor, Dr. E. L. Meyers, who lived in the country near Ransom. The first year Doctor Grisell kept his office in the local hotel. He then put up a small building on the lot where he is now located, and in a few years his reputation was established as a capable and faithful physician. In the fall of 1900 he took the examination before the State Pharmacy Board, was granted a certificate, and for four years had the management of the drug department in one of the general stores at Ransom. He then put up a separate building and installed a stock of drugs and sundries with his father-in-law as partner. Later he bought the entire business and has since conducted it under his individual management. Doctor Grisell is a member of the Kansas State Medical Society and the American Medical Association. For four years he was called upon to serve as police judge of Ransom. After the high school had been in existence at Ransom one year he was made a director of the school district, and was on the board of education and was president of the board until 1917 when he resigned. He is an active member of the Methodist Church, was for years a teacher in the Sunday school, and has served as a trustee. At LaCrosse, Kansas, September 4, 1902, Doctor Grisell married Miss Lona B. Marhofer. Her father, Fred Marhofer, who was born in Ohio of Austrian ancestry, came to McPherson County, Kansas, in 1885, and in the following year moved to Trego County, where he was one of the very early settlers. He is now living on a farm in Ness County. 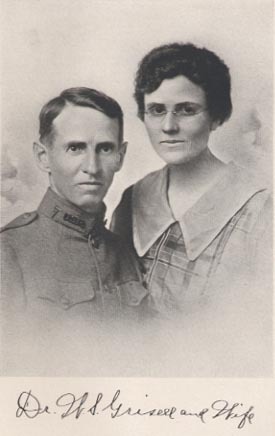 Fred Marhofer married Miss Ada Ferguson, and their children are: Mrs. Grisell, born April 1, 1881; Orris W. is in the aviation service of the United States; Albert was educated in the Manhattan Agricultural College and is in the Kansas oil field; Ray, is a farmer in Ness County; Vernon is a pharmacy student and farmer of Ness County, and Olin is an instructor in the Aviation Technical School at St. Paul. Doctor and Mrs. Grisell have no children. When war was declared against Germany Doctor Grisell applied for service, was ordered to Fort Leavenworth for examination but was rejected because of his being underweight. He applied again in November of the same year, was accepted and commissioned first lieutenant in the Medical Officers Reserve Corps. He was ordered into active service in the Medical Officers' Training Camp at Fort Riley, Kansas, April 3, 1918, and he remained on active duty till July 10th, when he was honorably discharged for physical disability.